I've done many things in jewelrymaking and metalsmithing, so I don't always do the same thing every year. Back in the mid to late 90's, I used to make a chain link that looks like two cotter pins that slided together, making a dog bone-like link. I had completely forgotten about it and then back in February, I was demostrating to a class on how to make chains, and I recollected this particular chain link. This time, I wanted to do a different twist, balling up the ends of the wire and then making them asymetrical so as they slided together, they created a new look. 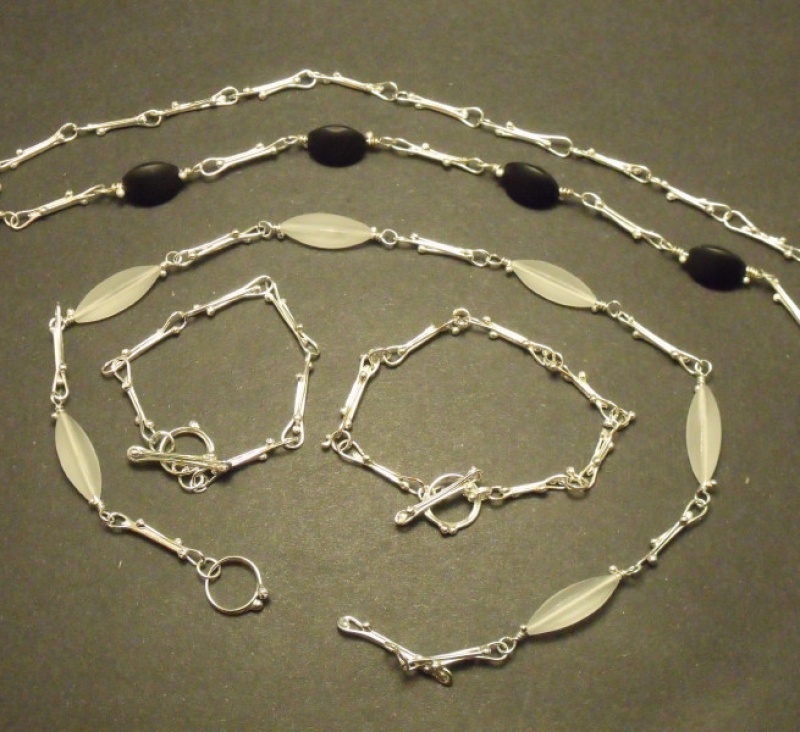 I liked them so much I made a plain chain necklace and bracelet. I also wanted to add stones, but not necessary a pendant, so by using unusual shaped black onyx and frosted quartz beads, it gave the chain linkage an elegance. Wirewrapped links with beads has been around for a long time. I used to make many chains made from wirewrapped beads links, and burned out on them 20 years ago. This time, rather than just wrapping the wire around the beads, I thought if I can ball up the ends of wire that wraps bead, it would add an extra dimension. I love the new chains I made, esp. the black onyx chain. It does pay to dust off an old idea and make it a little different for a fresher look. It's more time consuming to make these links so I'll have to work out a way to make it more productive for me. Maybe have the links casted so I can make more of those chains and do more variations.